I want to be a cynic about Valentine’s Day, I really do. I want to say that it’s a Hallmark holiday solely created to make up for 364 days of neglect. I want to say that it’s the cruelest form of torture for anyone who’s single. From those first days of decorating a mailbox for the receipt of Valentines, however, I remember liking Valentine’s Day. It’s a nice reminder that I live a life surrounded by people I love, people who love me. In honor of those exciting days of digging through Valentines, seeking out the best candy and overanalyzing the meaning of the line “Bee Mine” in the card from your crush, I’m doing my very first giveaway. To enter, comment on this post answering the question: “What’s your best (or worst, if you’re into that) Valentine’s Day memory?” Make sure you leave your first name! Wednesday night at 9 p.m., I’ll randomly select one lucky commenter as the recipient of either two dozen cookies or two loaves of bread. (Some options are here, here and here. I could also make something completely new. Winner’s choice!) You have until 8:59 p.m. on Wednesday (2/16) to enter. Unfortunately, the giveaway only applies to those of you in the continental United States. I’m still a student, folks. I’ve got bills to pay. 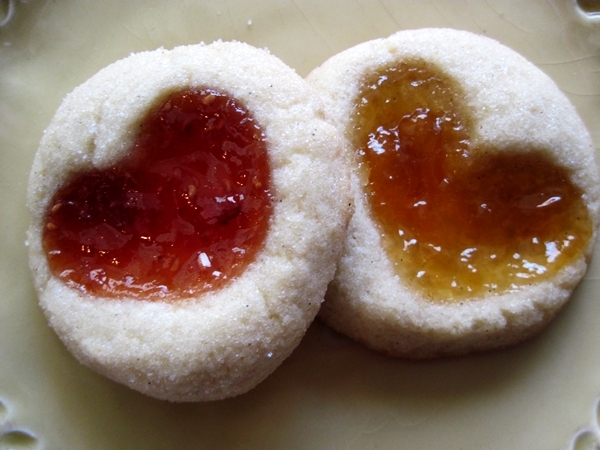 If you’re feeling like doing a bit of baking yourself, these thumbprint cookies are a tasty departure from those traditional Valentine’s Day chocolatey affairs. 1) Preheat oven to 350 degrees. Line two baking sheets with parchment paper. 2) In another bowl, beat the butter and the sugar until fluffy. Beat in the egg and vanilla until just combined. Slowly add in the flour, baking powder and salt. 3) Scoop the dough into 1-inch balls with a cookie dough baller. Pour sugar in a shallow bowl and roll dough balls in sugar. 4) Place dough balls on baking sheets. Press a thumbprint into the center of each ball, about 1/2-inch deep. (Alternatively, make a heart shape like I did by making a “V” with your pinky finger.) 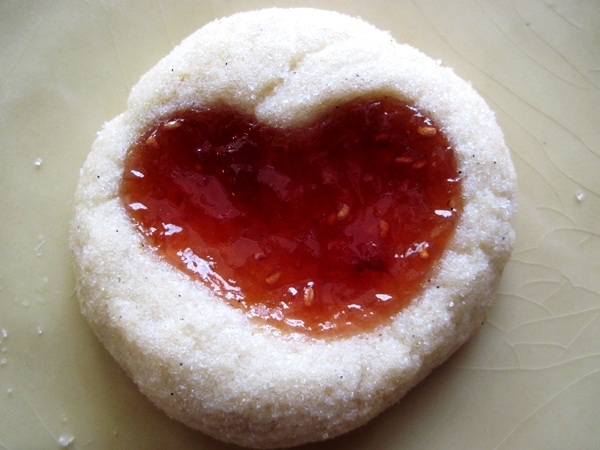 Fill each indentation with about 3/4 teaspoon jam. 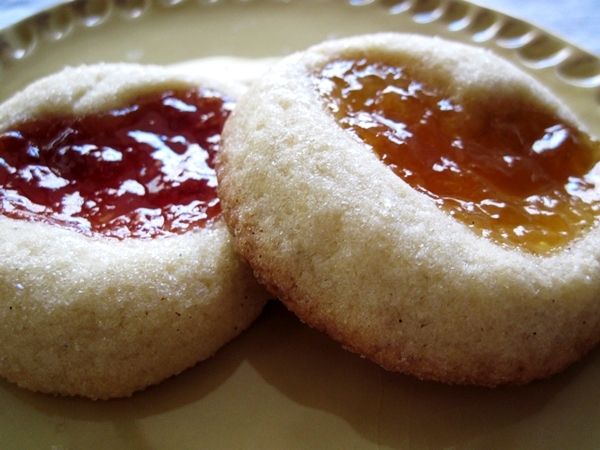 5) Bake cookies until the edges are golden, about 15 minutes. (For even color, rotate the pans from top to bottom about halfway through baking.) Cool cookies on the baking sheets.